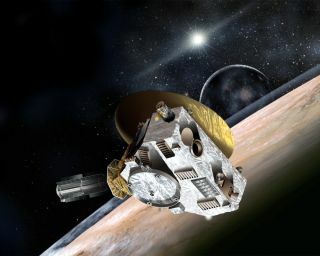 An artist's view shows NASA's New Horizons satellite observing the Pluto-Charon system. The icy surface of Pluto may provide insight into not only the dwarf planet, but also several other bodies in the solar system. Saturn's moon Titan boasts an atmosphere with methane rain and a landscape dotted with lakes of methane and ammonia; it's the only body in the solar system other than Earth known to house liquids on its surface. The presence of these liquid hydrocarbons makes Titan a candidate to host life — though it would probably have to be different than Earth life, which relies on liquid water. But the warm, welcoming atmosphere of the moon may not have lasted through its entire history. "It's likely that Titan's current atmosphere is not sustainable over geologic time — that is, on the order of billions of years," Wong told Space.com via email. "The current amount of methane in the atmosphere — the molecule that is responsible for the production of Titan's haze and exciting organic compounds — should not last for more than a few tens of millions of years." Wong, Yung and Gladstone suggested that Titan frequently undergoes a "snowball cycle," changing from an icy world to the moon it appears as today, and then back to ice. What drives the cycle? "Climate change," Wong said. "Titan's snowball state was probably ended by an injection of methane into the atmosphere." He compared the process to the way carbon dioxide injected into Earth's atmosphere heats the planet. Similarly, methane injected into Titan's atmosphere would have warmed the moon, Wong said. The moon-warming methane may have come from a geologically recent atmosphere, he added. Previous studies have found an isotope of argon that is the decay product of an isotope of potassium found in Titan's rocky interior. This, too, bears a strong similarity to Earth, where volcanoes released carbon dioxide into the air during the planet's snowball state, heating it up. In their research paper, the team described how the present atmosphere on Titan is built on a fragile balance among radiation, chemistry and dynamics. In fact, they called the entire system "a house of cards, with methane at its foundation." The frozen moon wouldn't make a perfect replica of Pluto, however; the dwarf planet's atmosphere is orders of magnitude thinner than Titan's, Wong said. "It's unlikely that Titan's atmosphere was ever that thin," he said. "But in Titan's snowball state, it certainly resembled Pluto a little more." Titan's frozen surface would look much different back then from how it appears today, Wong said. For one, the sky would be surprisingly clear. "Right now, if you were standing on Titan, you wouldn't be able to see the sun," he said. You wouldn't be able to see Saturn. You'd just see haze." "But on 'snowball' Titan — with much less methane, and thus a lot less of its photochemical products — the haze layer would not interfere with your stargazing." But that doesn't mean it would be a good place to lie out on a blanket and study the stars. Wong said Titan would be frigid — "almost liquid-nitrogen cold." (Nitrogen turns to a liquid at minus 320 degrees Fahrenheit (minus 196 degrees Celsius). The team's research was published in January in the journal Icarus. Today, Saturn's moon Titan has polar seas (shown here with the sun glinting off), but in the past, it may have been a giant snowball with a strong resemblance to Pluto. Although planetary scientists can't travel back in time to study the Titan of the past, New Horizons may help provide some insight into what it may have once looked like. "Titan may be a relatively recent manifestation of Pluto's atmosphere," said New Horizons project scientist Hal Weaver, of the Johns Hopkins University Applied Physics Laboratory in Laurel, Maryland. Weaver pointed out that Pluto also bears a strong resemblance to Triton, a moon of Neptune, which he called "the closest analogue to Pluto." Triton was likely captured from the Kuiper Belt, a region of rocky, frozen objects beyond the orbit of Neptune that includes Pluto. Images taken by NASA's Voyager 2 spacecraft revealed a haze around Triton similar to the light haze around the dwarf planet. Pluto also looks a lot like comets, the rocky ice (or icy rocks) that orbit the sun in highly elliptical orbits. Comets are thought to be one possible source of water on Earth (though more recent studies have suggested that asteroids played a more dominant role), and that Pluto could contain a subsurface ocean. The dwarf planet may simply be more evolved than comets because it is significantly more massive, Weaver said. Given Pluto's relationship to comets, Triton and Titan — not to mention the exciting first observations of the dwarf planet itself — New Horizons' flyby will likely reveal a bonanza of information, researchers said.